Does your garage have an old lawn mower, edger or other unwanted landscaping tools just taking up space? When you have a broken or obsolete lawn mower and other landscaping appliances, you know that getting rid of them can be difficult, uncomfortable, and dirty. Your old landscaping equipment probably lasted you for years. But, at some point, tools break down or perhaps you’ve upgraded to something bigger and better. Possibly you've even decided to throw in the towel and hire a professional landscaping firm. In fact, upgrading can be a smart choice on a number of levels. Newer models of lawn mowers and other landscaping and gardening tools are more efficient and less harmful to the environment than many of the older tools still being used in American homes. For example, it's been calculated by the U.S. Environmental Protection Agency (EPA) that a gas powered lawn mower produces as much volatile organic compounds and nitrogen oxides emissions air pollution in one hour of operation as 11 new cars each being driven for one hour. In addition, it's estimated that an average of about 54 million Americans mow their lawns, using 800 million gallons of gas per year. Anyone who has used a gas powered lawn mower or other landscaping tool knows that filling the tank can be a bit messy. In fact, the EPA estimates that 17 million gallons of fuel are spilled every year in the filling of yard equipment. That’s more gasoline spilled every year than all the oil spilled by the Exxon Valdez in the gulf of Alaska. According to the EPA, one gas mower spews 88 pounds of CO2 along with another 34 pounds of other pollutants into the air every year. Multiply this by 54 million lawn mowers and that's approximately 5% of the total air pollution produced in the US every year. The EPA and the state of California, both took steps to increase regulation of tractors and mowers in order to decrease emissions. The latest regulations took effect in 2011 for tractors and other riding models and in 2012 for mowers. Eighty percent of Class I models, which are walk-behind mowers, and nearly 70 percent of Class II, or riding mowers, engine families from the leading manufacturers had to be redesigned to be compliant, according to the EPA. These environment-minded improvements have created a entirely new class of equipment with the goal of making the older machines obsolete. In addition, technology has improved significantly, especially in the electric mower industry. According to a report from Technoavio, manufacturers of power lawn and garden equipment are incorporating advanced technologies. These include the introduction of robotic and battery-powered outdoor lawn mowers to improve productivity. "...advances in battery technologies, including improved performance and lower prices of lead acid and lithium-ion rechargeable battery packs, have allowed manufacturers to develop cordless electric mowers and other equipment for which mobility is a key factor." The problem for many homeowners is that they still have and use older equipment. In some cases, owners are still working with lawnmowers and other landscaping power tools that were built back in the 1990s or early 2000s. The best solution for these owners is to upgrade to take advantage of the latest in technology and comfort features, as well as eliminating more of the outdated and less-efficient tools. So the question then becomes "How do you get rid of an old lawn mower or a broken down edge trimmer?" Simply tossing them out is probably not an option. These are tools that are too big for the trash bin and probably have potentially toxic fuel and oil residues in them still. The good news is that there are a number of options available for lawn and landscaping tools and equipment that is still in working condition. As we've noted previously, deciding to get rid of your old equipment is one thing; actually figuring out a good way to do so can be a bit of a challenge. Most people will not be able to leave their old tools and equipment on the curb for their municipal waster removal service to haul away. Nor does everyone have the vehicles needed to take these items to the local landfill, assuming there is one. A garage or yard sale is almost always a great place to not only get rid of those old tools, but even make a little money from them, as well. Another way to sell your used equipment is online with a site like Craigslist. Be sure to clean them up as much as possible and post good photos to increase their appeal. Is your lawn mower in good enough shape for someone else to use? Does your old hedge trimmer still have it's edge? If so, you can always take them to a donation center because reuse is more environmentally friendly than disposal. In addition, you're helping out a good cause and providing someone else with an affordable option for their own lawn care needs. Do you know anyone who is need of good tools that either doesn't have the means or ability to acquire them? A great solution is to simply "gift" those individuals with a well-maintained and usable lawn mower or leaf blower. If you prefer, you can always arrange this through a third party who might know someone with a need. There is still a way to make some money from your old, but unusable, landscaping equipment. Whether it's an edger, leaf blower, hedge clippers, weed trimmer, snow blower or a lawnmower, there are materials in them and on them that can be sold. "Most buy mowers at scrap metal prices that fluctuate daily in accordance with the market. You won't get as much as if you parted it out, but engines and some decks are made with aluminum castings. Junkyards usually pay aluminum breakage prices, which is more than they pay for plain steel, for a mower sold as a unit." "Old lawn mowers and small engines are a great source of scrap aluminum and steel. Unfortunately, it is far too time consuming to take a whole small engine apart to separate into non-ferrous metals (using the magnet test). The trick for those of us selling them for scrap metal, however, is getting a fair price for the value of the metal." However, they go on to point out that small engine mechanics are often a far better source for selling your old powered equipment, even if they aren't currently running. According to the post you will be able to make two or three times more money by selling a lawn mower for parts than you would if you sold it to a scrap yard. Once you have completely dismantled the (emptied) and cleaned unit, use a magnet on all the metal components and separate the ferrous -- containing iron -- and non-ferrous - usually aluminum - metals. The magnet will stick to ferrous metals, but not to aluminum. This is important because aluminum is worth more money at a scrap yard. The mower deck, for example, is either made of ferrous steel or cast aluminum, depending on the brand and model. You should also test engine pieces in several places to determine if some parts have non-ferrous and ferrous materials. Be sure to separate the parts that are non-ferrous metal: one pile for clean aluminum pieces and another for the dirty, greasy engine parts or those with ferrous metal attached. This is known as "aluminum breakage" and nets a bit lower price. Put the metal parts in separate boxes and take them to a metal recycling center where you can sell the metal by weight. Take all the non-metal pieces and separate them as recyclable materials and trash. Most of the plastic pieces can be placed in your curbside recycling bin. Check the pieces thoroughly for the recycling symbol to determine if the plastic can be recycled in your area. When in doubt, simply add them to your household trash bin. Even the rubber tires and some tubing or cable sleeves can be taken to your local recycling center. If you have dismantled a rider mower, the foam from the seat, can be disposed with your regular household garbage, as well. If you simply want to be rid of your old equipment, but don't want to contribute to the waste stream, having a professional junk hauling firm pick them up can be a true eco-friendly option. 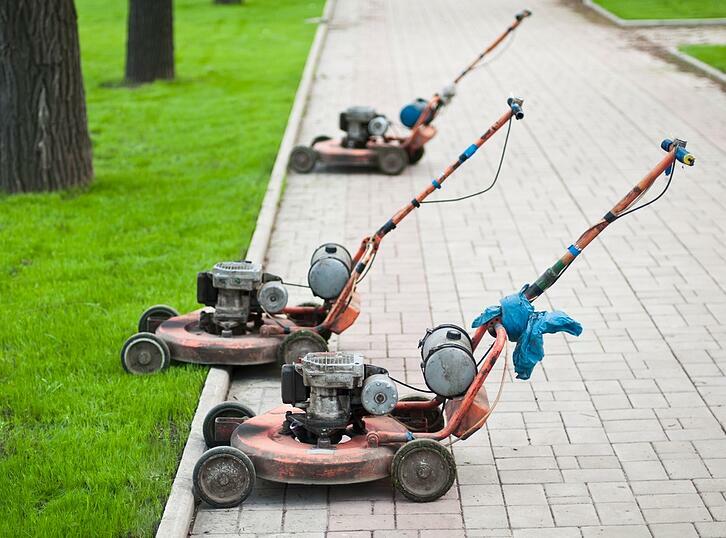 Lawn mowers and other landscaping equipment can be broken down into metal and plastic parts, cleaned free of gasoline or other substances and recycled industrially. This includes appliances like lawn mowers, leave blowers, wheelbarrows, hedge trimmers, edgers, weed trimmers and even chainsaws. While it's not exactly a landscaping tool, even your old barbecues can be picked up and recycled! There can often be other types of metals in an old tool. The question often comes up regarding what types of metals actually can be sold for scrap. Non-ferrous metals, such as copper, aluminum, brass, stainless steel and bronze, generally bring more money at scrap yards. While ferrous metals, like steel and iron, are not as valuable, the scrap yards will still accept these metals for recycling. "The most common metals accepted by scrap yards include copper, steel, aluminum, brass, iron and wires. But your local scrap yard may accept additional metals for recycling and give you cash payouts for your scrap metals. Call a few scrap yards in your area ahead of time for a list of scrap metals they accept for recycling"
If you choose to sell your old equipment and tools as scrap metal keep in mind how scrap is purchased by the scrap metal reclamation companies. Typically, scrap yards accept any quantity of metals for recycling, but what you will be paid is determined by the weight of each type of metal. For example, if you only have a few pieces of metal, they will still recycle it for you, but you’ll most likely receive little if any payout for your metals. A much more profitable and efficient approach is to "stockpile" your scrap metals until you’ve accumulated a decent amount. Another idea is to team up with friends or neighbors to provide a much larger haul for the scrap yard. Junk King offers appliance disposal and recycling for all kinds of landscaping equipment and junk removal to recycle appliances like lawn mowers can take this burden off your shoulders. We even go a step farther with scrap metal pick up. Junk King recycles more than half of the garbage we collect by hauling it off in our specialized trucks (many of which run on biodiesel), then separating it by material and sending everything to local recycling facilities. In some locations, Junk King even has its own recycling centers. We’re just as proud of our high marks for customer service as we are for being the greenest junk haulers. Junk King has been rated the best in North America for customer service, and you can see why from our customer testimonials. We’re fast, friendly, and amazingly efficient. 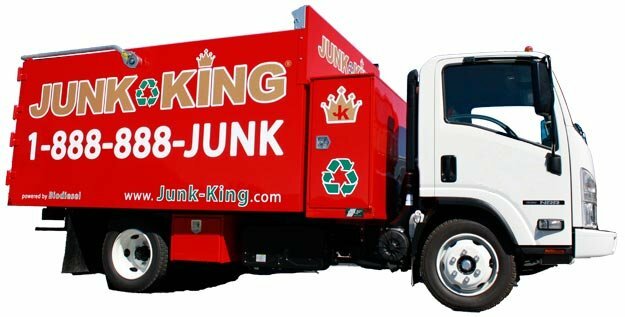 If you want trained professionals who show up on time and in uniform (and carry insurance...) then you need to hire Junk King. Make an appointment and we’ll provide an upfront estimate with no strings attached. Just show us the lawnmower and landscaping equipment and any other trash you want disposed of, and we quote you based on the volume of space the junk takes up in our truck. Our crews our not only efficient and friendly, but they are fast, as well! We’ll take your old or broken landscaping equipment off your hands and make sure it gets recycled or disposed of responsibly. Just give us a ring at 1.888.888.JUNK (5865).